Erin and Westmont Police Department Deputy Chief Brian Gruen are the “stars” of the ad campaign for the annual Special Olympics fundraiser Cop On A Rooftop, hosted by Dunkin’ Donuts. Erin and Deputy Chief Gruen are featured in posters, videos, and even a billboard campaign to promote the event. 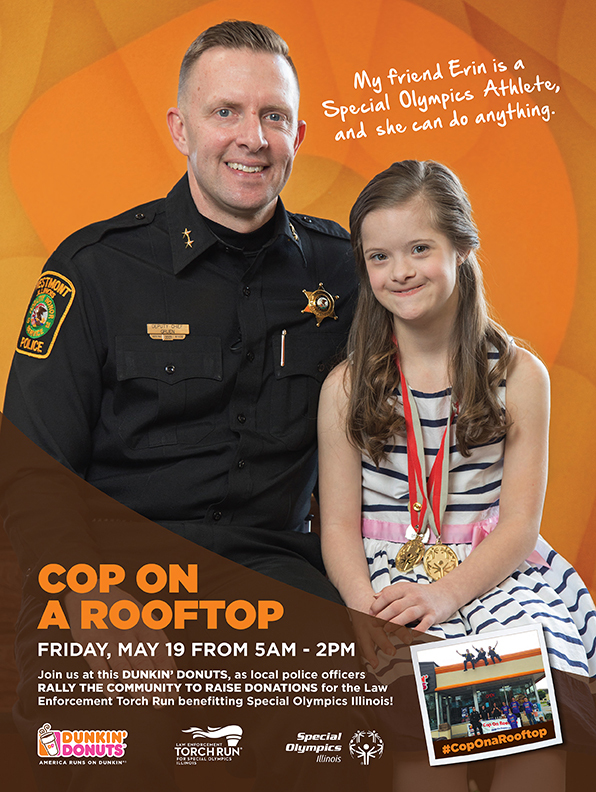 The Cop On A Rooftop fundraiser will take place at participating Dunkin’ Donuts on Friday, May 19, 5:00 a.m. to 2:00 p.m.
For Erin and other athletes with special needs, being part of Special Olympics is much more than having an opportunity to compete and have fun. “Special Olympics makes me love being me,” said Erin. “I love the rhythmic gymnastics routines and riding horses. Being a Global Messenger is awesome!” The Special Olympics Global Messenger Program allows athletes with special needs the opportunity to provide outreach and encourage advocacy for people with intellectual disabilities. To become a Special Olympics Global Messenger, Erin attended a 2-day public speaking course. Since that time, Erin has given numerous speeches at various events regarding the importance of advocacy for people with special needs. Diane recalls a time of great fear and uncertainty when Erin was first born. “Erin had a lot of medical issues,” shared Diane. “For the first two years, really.” And then a friend from the community and an active member of the Illinois Law Enforcement Torch Run introduced the Compton’s to the idea of joining Special Olympics. The Westmont Police Department has already completed several fundraising events and are working on more. In April, the Westmont Fraternal Order of Police coordinated a volleyball tournament with local schools and the Westmont Fire Department, which raised $2600. They’ve also hosted fundraising nights with local restaurants including Chipotle and Potbelly. And they are currently working the “5-0 Whiskers Club” in which Westmont Police Officers will grow beards and solicit sponsors to raise money. The Illinois Law Enforcement Torch Run is a State-wide effort to raise money for Special Olympics. One of their events is the actual Torch Run in which the Special Olympics Torch is carried by law enforcement personnel across the State of Illinois. The Torch Run will come through Westmont on Sunday, June 4. Details and times will be announced soon.